The think my problem with it probably stems from the fact I was never read it as a child. Maybe then I would have fond memorie s of it, and reading the book would have had a certain amount of nostalgic value attached to it, or something like that. Of course I am familiar enough with the story to know the settings and characters. As it stands though, I am really finding the book to be a bit of a drag. 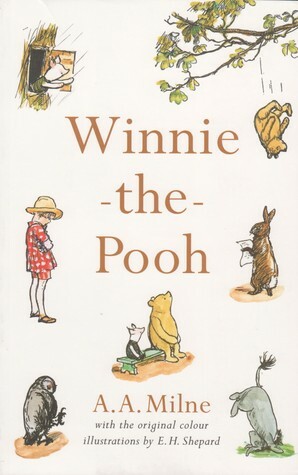 The narrative is certainly interesting, how it switches between the narrator at home with Christopher Robin and then the fictional world with Pooh. At times this can be a bit frustrating, and I want to shake Milne and tell him to get on with the story. ‘If only I hadn’t-‘ he said, as he bounded twenty feet on to the next branch. ‘Of course, it was rather-‘ he admitted, as he slithered very quickly through the next six branches. Has anyone else had this problem when reading a children’s classic, or any classic? You feel you should like it because of its prestige but you just don’t? Of course, I’m going to persist. If I can’t get through Winnie the Pooh then there really isn’t any hope for me.